A new paper titled ‘Multi-scale marine biodiversity patterns inferred efficiently from habitat image processing‘ outlines a rapid, efficient, and low-cost way to measure species diversity through digital habitat images that require little image processing or interpretation. Using this system marine life can potentially be examined in a much simpler fashion. 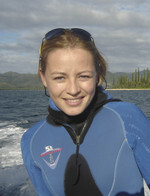 The paper involves Environment Institute members Dr Camille Mellin (also of Australian Institute of Marine Science) and Corey Bradshaw as well as Lael Parrot (University of Montreal), Serge Andrefouet (Institut de Recherche pour le Developpement), Aaron MacNeil (Australian Institute of Marine Science) and Julian Caley (Australian Institute of Marine Science) has been published in Ecological Applications. This entry was posted in GEL, Publications and tagged Camille Mellin, Corey Bradshaw, Environment Institute, Habitat, Marine Science, species. Bookmark the permalink.